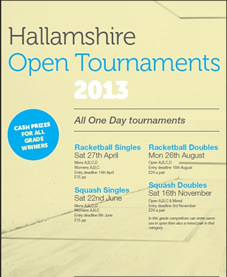 The Hallamshire Racketball Open 2013 is on Saturday 27th April 2013 and is a 1 day tournament with several grades for all standards. With over 90 competitors last year this looks set to be a fantastic tournament for 2013. Entry price is £15, with a free tournament t-shirt included. There are Cash Prizes for all winners & Runners Up. Everyone is guaranteed at least 3 matches in the tournament. Entry deadline is 14th of April 2013. Enter online here. Or if you wish, you can enter by post or over the telephone with the rececptionist at Hallamshire. Food, drinks & refreshments will be available all throughout the day.